This month, I'm featuring Gifted by H.A. Swain! 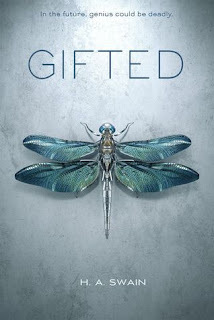 I actually read/reviewed Gifted back in April, but in the past month, I have not read a single book dealing with science or mathematics, specifically! So I thought I'd go back and feature one that I really wanted to feature in May, but chose a different one. Gifted is a story set in a world where ability like singing, or doing complex mathematics can be surgically induced in a person. Buy an Acquired Savant Ability (ASA) and you'll have the surgery, and in the next short few weeks, you'll be a prodigy. Interesting, no? Today, I'm going to take about savant skills! A savant is defined as "a person who knows a lot about a particular subject", or "a person who does not have normal intelligence but who has very unusual mental abilities that other people do not have" (see Merriam-Webster's dictionary). Savant skills aren't new to the medical field - scientists have long known about savant skills, mostly in people with autism. Savant syndrome is a condition in which a person with a mental disability has abilities that are beyond normal in scope. This syndrome has been seen in people with autism, or brain injuries. Savant syndrome is quite rare. A scientific paper by Treffert notes that as many as one in ten autistic persons have exceptional abilities (Treffert 2009). The first documented case of savant syndrome was in 1783, when a boy showed proficiency in mathematics and counting, but little understanding in his other studies (Treffert 2009). In 1887, ten cases were studied by a physician at the hospital that the ten children were being treated in. Only 50% of people with savant syndrome have been noted to have autism. The other 50% had some other central nervous system (CNS) damage. An interesting fact - while the syndrome is very rare, there are six times as many males with savant syndrome as females. No theory has been proven, on how savant syndrome is developed, or how it works in the brain. No one knows how it is "turned on", or why it seems that only people with CNS damage or diseases have savant syndrome. There are theories about how their brains are wired differently. Most learning occurs implicitly - meaning that it needn't be explained. One writer of Scientific America argues that perhaps savants learn the skill implicitly, and because of the different wiring of the brain of the savant, the skill pops up all at once. I don't have a ton of facts or statistics to share, about savant syndrome. But it's a hot topic of debate; what if there was a part of our brain that we could just switch on, and new abilities would kick in? Unfortunately, the statement that humans only use 10% of our brain is a complete myth - we use 100% of our brain. But what if there was some part that could be engaged or awakened further? For savant syndrome (an autistic savant, to be precise) in pop culture, check out the movie Rain Man! What do you think? Do you think anyone could be a savant, if something was induced in his/her brain? Would you go through with something like the ASA surgery in Gifted, to acquire an ability? What ability would you want? I had no idea this existed. Thanks for opening my eyes! I don't know if I would go through an ASA surgery like that in Gifted. I have no idea what ability I would acquire! It's a strange and somewhat unknown area in the medical field! I'm not sure I'd want to go through with a surgery like that - especially given the consequences, in Gifted! 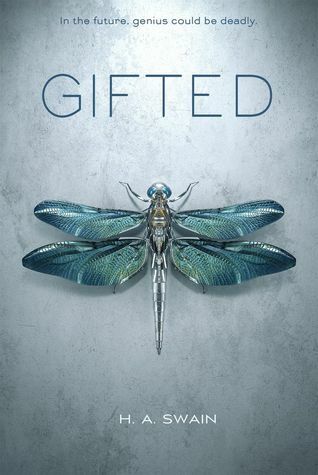 I haven't read Gifted but, based on the synopsis, it sounds like it also raises some interesting issues regarding "designer babies. "Did that feature at all in the book? Photographic memory would be awesome! Especially for school. A designer baby is a "baby whose genetic makeup has been artificially selected by genetic engineering combined with in vitro fertilization to ensure the presence or absence of particular genes or characteristics." Apparently we're getting pretty close to reality on some of this stuff. Much debate ahead for the scientific community. Ahhh, I see what you mean. In this book, it's more like ONE specific skill is amplified, though one boy in the story had two ASAs done. And all of these people are teens. But I think the idea is the same. In terms of disease and conditions, designer baby gene selection would be good, but there is no line in terms of what else could be done to the baby's genes! Like this ASA surgery, in Gifted. It's a scary and impressive time we live in, that I can say for sure! I've got an egalley of this I still need to read, I liked the author's other book that I read! Hmm. A savant skill might be like reading really fast and memorizing as I saw it? Think how many more books I could get read! Thanks for sharing this, I'm even more eager to read this now. And as a former science teacher, I love this "science in fiction" theme! It's a winner in my book! I'd not read any of the author's other books. Yes, exactly that! I'd love to have photographic memory, though I'm sure there are negative consequences to something even like that. Thank you, Lisa! I appreciate that! I want to read the book! I would definitely have to pass onthe surgery though. What if it ended up like Flowers for Algernon? 😢 I will pass on taking any chances like that. Girl, I probably would too. I'm afraid of surgery, as it is! Ok... this is really interesting. I have no idea about it, but now I want to ask google a couple of questions, lol. I would pass on the surgery, too. But now I want to read this book. Thank you! And OMG languages is SUCH a great choices! I love learning languages and would totally love to have that savant skill. Limitless possibilities there!